Couscous salad with cherry tomatoes and mozzarella – an easy, colorful spring salad featuring couscous, cherry tomatoes and fresh mozzarella. This couscous salad with cherry tomatoes and mozzarella is a colorful, easy, spring salad. A mixture of baby spring greens are tossed with nutty whole wheat couscous. Next, sweet cherry tomatoes, creamy mozzarella, salty olives and toasted pine nuts are casually tossed over the salad and then drizzled with a robust balsamic dressing. This is an ideal salad to celebrate the arrival of spring. I like to add grains to salads to make them more substantial. Couscous is one of the easiest to add since it only takes minutes to make. Once the couscous is cooked, let it cool slightly. Then toss it with the spring mixed greens and half the balsamic dressing. This is the base of your salad. For a pretty, colorful presentation, scatter the cherry tomatoes, fresh mozzarella, olives, pine nuts and a little red onion over the top of the couscous and salad mixture and drizzle with the remaining dressing. This would be a great salad for Easter lunch or a spring gathering. It’s colorful, flavorful and easy to prep ahead of time. Just chop all the veggies and cheese and make the dressing. Refrigerate the prepped ingredients until ready to assemble the salad. Then right before serving, cook the couscous and prepare the salad as per the directions below. 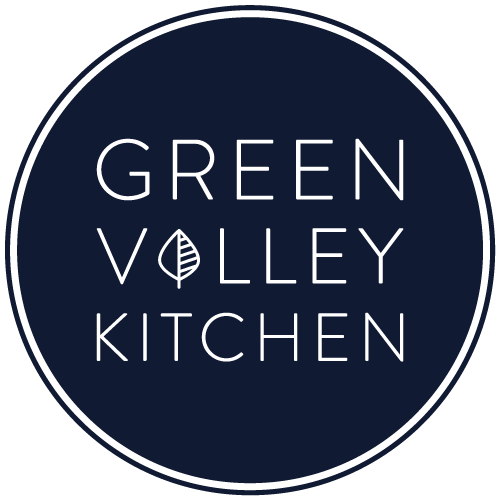 Give your greens a rough chop before adding them to the serving bowl. This will make them much easier to serve and eat. 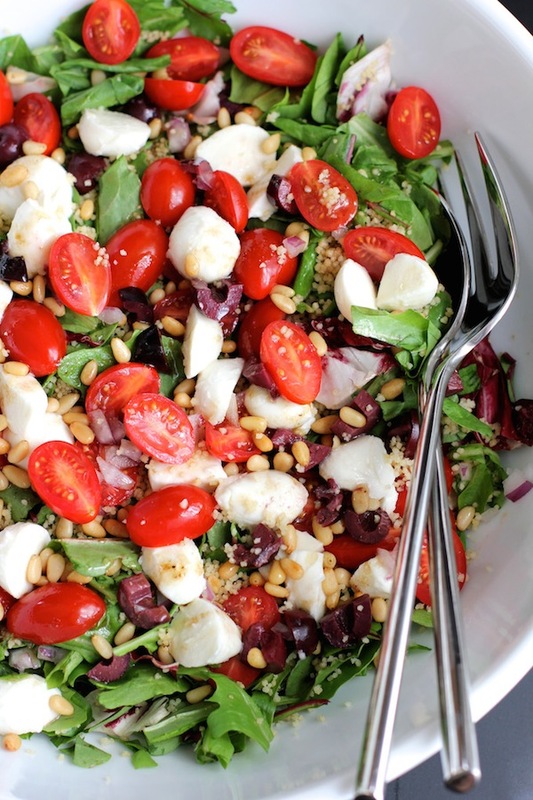 Definitely use fresh mozzarella in this salad. Fresh mozzarella is creamy and softer than regular mozzarella. 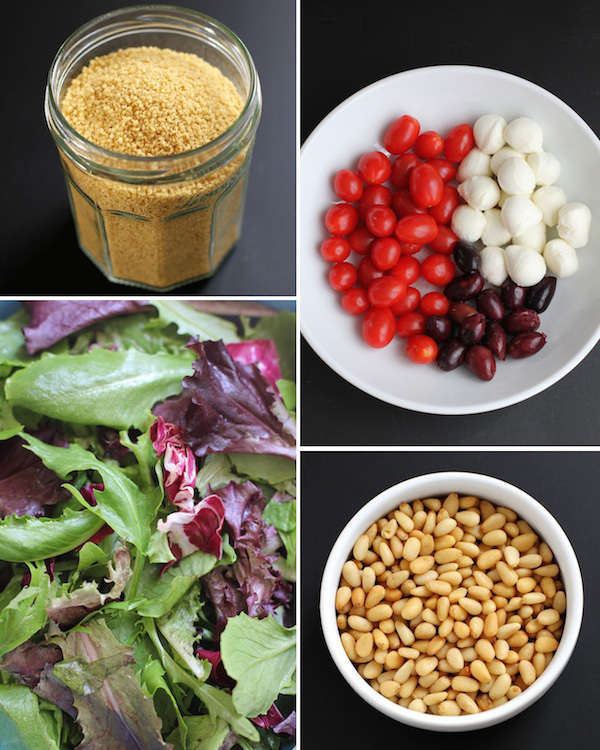 Toasted pine nuts make all the difference in this salad. Just be careful when toasting pine nuts – they can burn very quickly. It only takes a minute or two to brown them by toasting them in a skillet over medium heat. Make sure to shake the pan continuously. Or you can just cheat like I did and buy already toasted pine nuts – I found mine at Trader Joe’s. An easy, colorful spring salad featuring couscous, cherry tomatoes and fresh mozzarella. 1/2 cup of dry whole wheat couscous – cooked as per package instructions – should yield about 1 cup of cooked couscous. 3/4 cup of fresh mozzarella – I used Trader Joe’s ciliegine mozzarella balls – sliced in half or thirds. 1/4 cup toasted pine nuts. Cook couscous as per package instructions. Let cool slightly. Rinse, dry and roughly chop lettuce and add to a large serving bowl. Chop cherry tomatoes, mozzarella, olives, red onion and set aside. Toast pine nuts in a frying pan over medium heat until pine nuts are golden. Keep shaking, moving the pan otherwise the pine nuts will burn. Make dressing by combining all ingredients and whisking. Add couscous to lettuce in large serving bowl. Toss with half the dressing. Sprinkle cherry tomatoes, mozzarella, olives, red onion and pine nuts over the couscous and lettuce. Drizzle with the remaining dressing and serve. Thanks for stopping by and I hope you enjoy the recipe. You can find me on instagram and pinterest too. I use a lot of couscous, but have never mixed it with salad greens before. What a great idea! I really like all the flavor combinations you use! Very pretty too! Oh my! This looks delicious AND beautiful! This looks like simple, fresh, Italian deliciousness! I loooooove grain salads and this one looks amazing! Thanks, Kate. I’m a big grain salad lover too! This salad is perfect! Loving all those amazing flavours – I’m definitely going to be making this for lunch! Hi Jess – hope you try it – it’s an easy, tasty lunch! I love a big old fresh salad like this one, looks amazing, Geraldine! And I can never say no to anything that includes pine nuts and fresh mozzarella! I am very much ready for some spring weather and fresh produce! Thanks, Denise. 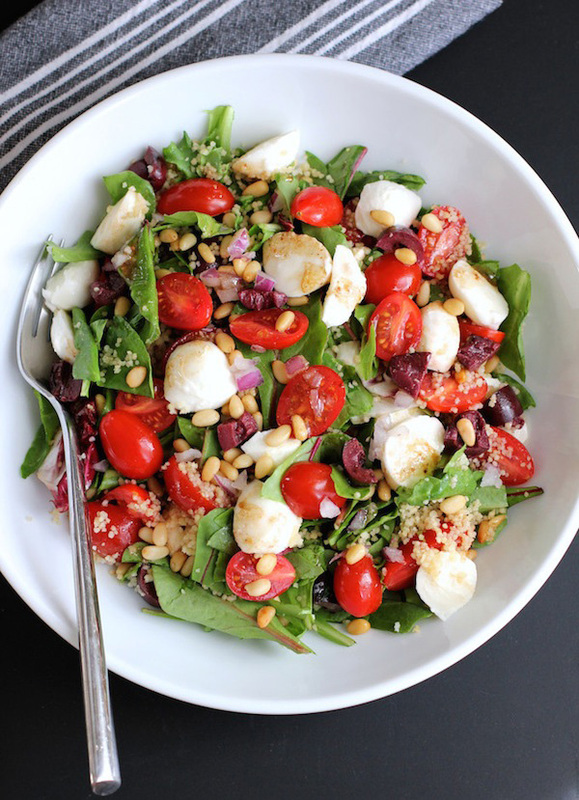 I’m with you on pine nuts and fresh mozzarella – they really make this salad. Hope spring gets to you real soon! I love how easy cous cous is to make! And those balls of mozzarella are mouthwatering! This salad looks so fresh and delicious! What a beautiful and hearty-looking salad! I love putting quinoa in salads, but have never tried using couscous – that’s about to change, though! I’ll have to pack some of this for weekday lunches. Yum! Thanks! I’m a big quinoa fan too. It’s great how grains make a salad a bit more substantial – so you’re not starving an hour after eating one! Thanks, Annie! Birds chirping is the first sign – soon they been green buds everywhere! You have a way about you when it comes to balancing textures that is really fantastic. You get crunch, you get creaminess, you get salty and sweet. You get rustic and savory, and all the extras. It’s great to see! Thanks so much, Kelsey! Your description of the salad was what I was trying to achieve! Thanks so much, Julia! It’s always amazing how fast spring sneaks up on you – it’ll get to you before you know it. You already have roses?? Dang! I’ll be lucky to have roses by July! I love how you arranged your ingredient photographs.. so pretty. What a fabulous salad, Geraldine. Mozzarella is one of my favorite cheeses, so creamy and mild and fits perfectly with the flavors you’ve incorporated in this salad! Love the color too! Are you planting cherry tomatoes again this year? Thanks, Traci! Yes, I’m growing a black cherry tomato plant this year – looking forward to seeing how it tastes. It’s been so warm here that some of my tomato plants already have little green tomatoes growing. I’ll have an early crop this year! Hi Lily – hope you try it – it’s really easy to put together. Thanks for stopping by!